"The NPT aims to prevent the spread of nuclear weapons and weapons technology, to foster the peaceful uses of nuclear energy, and to further the goal of disarmament." "Israel holds a nuclear arsenal of 80 weapons that were manufactured no later than 2004, according to a new analysis by noted Federation of American Scientists experts Hans Kristensen and Robert Norris." 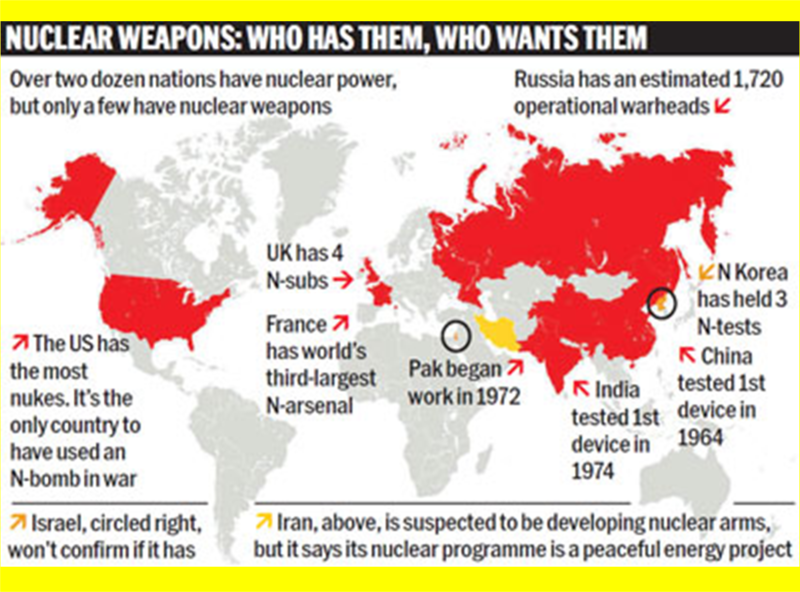 "More than two dozen countries have nuclear power, but only a few have nuclear weapons or are suspected of pursuing nuclear weapons." "Since 2003, worldwide concern over Iran's nuclear program has increased as Iran and the International Atomic Energy Agency (IAEA)spar over investigation and details of Iran's program." "The surprise disclosure of an intelligence assessment about North Korea's nuclear capabilities this week raised further questions over what the United States believes the communist nation is capable of..."
"North Korea's nuclear programme remains a source of deep concern for the international community."